Crisis Connections, formerly known as Crisis Clinic, offers confidential, compassionate and non-judgmental telephone-based crisis intervention, emotional support and information & referrals to community services for youth and adults. Volunteers on the 24-hour Crisis Line provide community members calling in with confidential, empathetic support and receive free professional training for their role from our outstanding team of professionals. Volunteers acquire advanced communication skills, hands on experience in community behavioral health, on-going mentoring by Licensed Mental Health Professionals as supervisors and enjoy participating in providing a meaningful and necessary form of community service. Volunteer phone workers on the 24-Hour Crisis Line help callers deal with emotionally stressful and often traumatic events - suicide, self-harm, abusive relationships, mental illness, grief and loss and other challenging and difficult issues such as substance use and homelessness. This special opportunity is suitable for emotionally mature individuals who are comfortable working within a structured, team environment. Volunteers must also be 21+, thoughtfully commit to a 4 week volunteer training program (4 full Saturdays and plus online) prior to active volunteering and be able to make a commitment to 12 months of service on a once weekly 4-4.5 hour phone shift. Crisis Connections is currently recruiting for our Summer 2019 Volunteer Cohort. 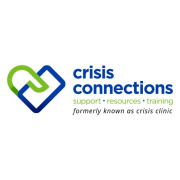 Crisis Connections' volunteer training program is a hybrid of facilitated on-line classroom training (can be done remotely) + onsite facilitated practice sessions (in-person at Crisis Connections' Northgate business office.) Interested applicants complete a multi-step application process: submitting a completed application and references, attending an Orientation & Screening, and completing a short one-on-one phone interview. Crisis Connections has served the Seattle-King County, WA area for over 50 Years. As an organization that began as a grassroots effort grounded in the value of volunteerism, we continue to invest in and rely on the skilled and committed service of over 200 volunteers to work with us to meet the needs of those in crisis. Join our amazing community and start helping lives on the line! For more information on volunteering with Crisis Connections, please visit our website at https://www.crisisconnections.org/get-involved/volunteer/ or reach out to volunteerservices@crisisconnections.org.